Merchants can hear about topics concerning online selling and Auctiva products firsthand by following Auctiva's founder and CEO on Twitter. "I continuously try to stay up on the latest news and trends in e-commerce and I frequent several sites to read up on new technologies," Schlicht says. "I come across a lot of articles, blogs, links, etc. that would be helpful to both sellers and developers. Twitter's immediacy makes it easy to share these resources with others, who, like me, want to keep up on the latest." 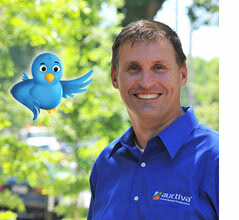 Schlicht says he'll use a good portion of his tweets to keep sellers informed about upcoming enhancements and innovations by Auctiva Corp., including Auctiva.com, Auctiva Commerce, Auctiva Marketplace Platform and other sites and services. "We regularly announce our enhancements using forum posts and blogs, but now sellers can see what we're doing in 140 characters or less—in near-real time," Schlicht says. "Since we announced the initial release of the Auctiva Marketplace Platform, I receive regular inquiries about its progress and development, so I'll continue to post updates about AMP on my Twitter account. This lets followers track our progress and the direction in which we are heading." One recent tweet gives a preview of SnapSell, a new mobile application that, when it's released, will allow sellers to add inventory to the new Auctiva Marketplace Platform. To follow Schlicht, click here.